A recent market study published by Persistence Market Research 'LoRa Gateway Module Market: Global Industry Analysis 2013-2017 and Opportunity Assessment 2018-2028', provides the global market dynamics and trends of the LoRa gateway module market across seven regions: North America, Latin America, Europe, South Asia, East Asia, Oceania, and Middle East & Africa. The report also provides the current nature and the future status of the LoRa gateway module market over the forecast period. A direct market overview provides the growth scenarios and market potential with maximum precision, and adjudged with suitable assumptions. The report features unique and relevant factors that are likely to have a significant impact on the LoRa gateway module market during the forecast period. This report includes a detailed and considerable amount of inclusion, which will help new manufacturers in the most comprehensive manner for better understanding. The report commences with the executive summary of the LoRa gateway module market report, which includes a summary of the key findings and key statistics of the market. It includes the market value share for the leading segments in the LoRa gateway module market. In addition, this section includes the supply side trends, demand side trends, and recommendation for the LoRa gateway module market. Readers can find a detailed market structure and definition of the LoRa gateway module market, which will help them understand the basic information, such as market dynamics, key players, and regulation policies, included in the report about the LoRa gateway module market. The definition section considers the factors included and excluded for the purpose of this report. Readers can find the outlook of the global LoRa gateway module market taking into consideration the various factors associated with the growth, which will help them track the current scenario of the market, with key inferences drawn from historical data, current trends, and future prospects. The macro-economic factors influencing the market are also discussed in this segment. Based on the region, the LoRa gateway module market has been segmented into North America, Latin America, Europe, East Asia, South Asia, Oceania, and the Middle East & Africa. 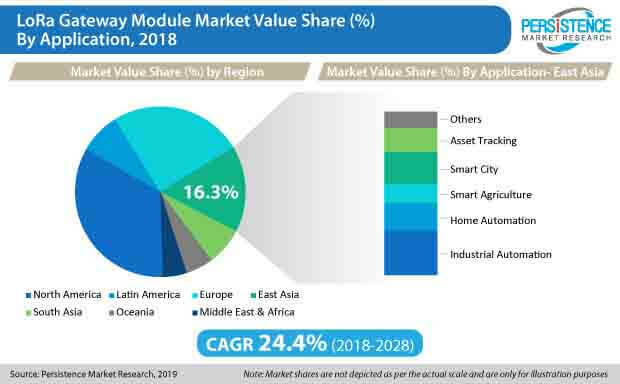 Readers can find detailed information regarding the key market trends, developments, and market attractive analysis in the LoRa gateway module market based on region. This chapter summarizes the information regarding the key market trends and attractiveness analysis of the LoRa gateway module market based application. On the basis of application, the LoRa gateway module market has been segmented into industrial automation, home automation, smart agriculture, smart city, asset tracking, and others. This chapter summarizes the information regarding the key market trends and attractiveness analysis of the LoRa gateway module market based on industry. On the basis of industry, the LoRa gateway module market has been segmented into manufacturing, energy & utilities, automotive, healthcare, transportation & logistics, agriculture, and others. This chapter includes the detailed analysis of the growth observed in the North America LoRa gateway module market, along with a country-wise assessment of the U.S. and Canada markets. Readers can also find information on the regional trends, regulations, and market growth based on the system, application and countries in North America. This chapter includes a detailed analysis of the growth of the Latin America LoRa gateway module market, along with a country-wise assessment that includes Brazil, Mexico, and Rest of Latin America. Market attractiveness based on various segments is provided for the Latin American region. Important growth prospects of the LoRa gateway module market can be found with market attractiveness based on system and application. European countries, such as the U.K., Germany, France, Italy, Spain, BENULUX, Russia, and Rest of Europe, are included in this chapter for industry analysis. China, Japan, and South Korea are the leading countries/regions in East Asia, which are assessed to obtain the growth prospects of the East Asia LoRa gateway module market in this chapter. Readers can find detailed information about the growth parameters. Market attractiveness based on application, industry, and country for LoRa gateway modules in the East Asia region is also provided in this section. India, Thailand, Indonesia, Malaysia, and the rest of South Asia are the leading countries/regions in South Asia, which are assessed to obtain the growth prospects of the South Asia LoRa gateway module market in this chapter. Readers can find detailed information about the growth parameters. Market attractiveness based on the system and application of LoRa gateway modules in the South Asia region is also provided in this section. Australia and New Zealand are the leading countries/regions in Oceania, which are assessed to obtain the growth prospects of the Oceania LoRa gateway module market in this chapter. Readers can find detailed information about the growth parameters. Market attractiveness based on the system and application of LoRa gateway modules in the Oceania region is also provided in this section. This chapter provides information about how the LoRa gateway module market will grow in the major countries of the MEA region, such as South Africa, GCC Countries, Northern Africa, and Rest of MEA, during the period 2018-2028. This section includes the market analysis by tier of companies, market concentration, and share analysis of the key players of the LoRa gateway module market. This chapter includes a comprehensive list of all the leading manufacturers in the LoRa gateway module market, along with detailed information about each company, which includes the company overview, revenue share, strategic overview, and recent company developments. Market players featured in this report include Semtech Corporation, Shenzhen Rakwireless Technology Co., Ltd., Microchip Technology, Inc., Multi-Tech Systems, Inc., Murata Manufacturing Co., Ltd., Libelium Comunicaciones Distribuidas S.L, IMST GmbH, GlobalSat WorldCom Corporation, Embit s.r.l., LINK LABS, and Laird Technologies, Inc. This chapter helps readers understand the research methodology that is followed to obtain various conclusions, important qualitative information, and quantitative information about the LoRa gateway module market. High growth rate has been estimated for the global LoRa gateway module market over 2018-2028, majorly driven by the rapid expansion of IoT. The number of IoT connections (non-cellular and cellular) are expected to increase by more than threefold worldwide between 2017 and 2025, and reach 25 billion. In 2017, the total number of IoT connections in the Asia Pacific was approximately 2.8 Bn, and it is expected to reach 10.9 Bn in 2025. The presence of a large and ever-expanding IoT market is expected to generate substantial demand for LoRa gateway modules. The presence of various manufacturers of LoRa gateway modules, rapid digitalization, and the growth of smart devices are among the major factors contributing to the growth of the LoRa gateway module market in East Asia. Moreover, the region is also projected to surpass North America and is expected to become the largest market for LoRa gateway modules during the forecast period. Increasing demand for automation in industries and the rising trend of Industry 4.0 are among the major factors driving the LoRa gateway module market. Increasing awareness and advantages associated with LoRa technology are propelling the LoRa gateway module market. The governments of various countries are significantly investing in LoRa technology and are collaborating with providers of LoRa gateway modules and services for the implementation of the LoRa technology in their countries. According to PMR, this is expected to remain a key factor driving the demand for LoRa gateway modules at the global level. Digital transformation is reforming some of the business activities that will transform business processes and provide new revenue models using digital technologies. The rising traction of digital transformation in various sectors such as energy & utilities, manufacturing, healthcare, and automotive, are creating potential opportunities for the LoRa gateway module market. Moreover, the adoption of cloud-based solutions and technologies is also playing an important role in driving the LoRa gateway module market. The lack infrastructural development, especially in underdeveloped counties as well as some of the developing countries around the world, is one of the factors that is hampering the growth of the LoRa gateway module market. Moreover, the requirement of high capital and skilled labor for the implementation of LoRa technology is restraining the growth of the LoRa gateway module market. The global LoRa gateway module market represents a moderately consolidated competition landscape, wherein Tier 1 companies hold a revenue share of approximately 34%. While most of the key players maintain strategic focus on the North America, Europe, and East Asia markets, the report underscores that technology assessment will be an important developmental strategy for companies. Leading players in LoRa gateway module market are also concentrating on entering into partnerships and collaborations with M2M and IoT device providers, and this will remain a strong differentiation strategy. Important entrants in the LoRa gateway module market, such as LINK LABS and Nemeus, are strategizing on new product launches. For instance, in April 2017, Nemeus released the MM002-L-JP module, which is in compliance with the LoRa mode and LoRaWAN protocol in the band 920.6-928MHz, with a maximum output power of +13dBm. The number of international distributors and resellers of new LoRa gateway modules is increasing at a rapid pace. Guangdong Dapu Communication Technology Co., Ltd.